See the bottom of this article for an addendum. 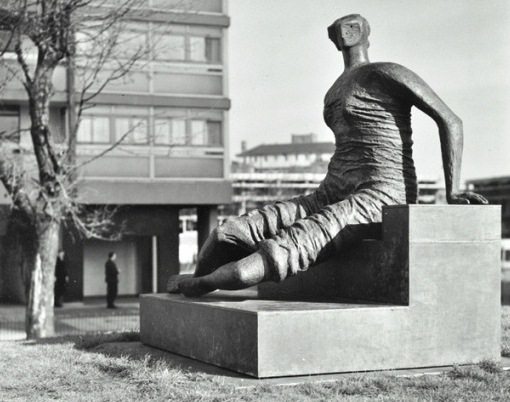 The news that Tower Hamlets council plans to sell Henry Moore sculpture Draped Seated Woman to plug funding gaps has brought howls of protest and sparked a debate on whether public art is a luxury London can't afford. We would like to express our concern about the proposal by the mayor of Tower Hamlets to sell the sculpture Draped Seated Woman by Henry Moore. While we understand the financial pressures that Tower Hamlets faces, we feel that the mayor's proposal goes against the spirit of Henry Moore's original sale to London County Council at a favourable price on the understanding that it would be placed in East London. The sculpture was sold to the former London County Council in 1960 by Henry Moore for £6,000 on the condition that it was displayed in a public space for the residents of a socially deprived area. The price tag attached to it in October by Tower Hamlets council is £20m. Mayor Lutfur Rahman says that budget cuts, fear of metal theft and the cost of insuring the sculpture make it too costly to keep. To complicate matters further, the sculpture hasn't been displayed in London for 15 years — it currently resides in the Yorkshire Sculpture Park — and according to this report, our friends north of Watford Gap aren't keen to let it go. Pleas to the council from Museum of London Docklands and the Canary Wharf Group to display the sculpture apparently fell on deaf ears. "The challenge for Tower Hamlets is revenue funding. This is a one-off piece of capital funding. It's only a stop-gap measure, and the people of Tower Hamlets will have lost an asset for ever." Doubts have been cast on the council's claim that they are unable to insure the sculpture too. Again, in the Guardian's piece on Tower Hamlets' plans, Queen Mary college claims to have obtained a quote of £2,000 to insure it. So why is mayor Rahman so anxious to sell off the sculpture, both in the face of strong opposition and for so little long-term benefit? It's true that metal theft has been an increasing problem — another of the artist's works was stolen from the Henry Moore Foundation in Hertfordshire earlier this year though later recovered. Dulwich Park also lost its Barbara Hepworth sculpture last year to metal thieves while a statue of Dr Salter disappeared from Bermondsey. But are Tower Hamlets' reasons for wanting to sell the piece strong enough to permanently deprive the residents of the borough of a piece of art intended for their enjoyment? See here for a petition to bring the sculpture back to the east end. We mapped the locations of London's Henry Moore sculptures in 2010. Photo by London Metropolitan Archives in the Londonist Flickr pool. In a letter (dated 23 October 2012) Sharon Ament, Director of the Museum of London, wrote to Councillor Lutfur Rahman, Mayor of Tower Hamlets, suggesting the long-term loan of Henry Moore’s Draped Seated Woman to the Museum of London for public display either internally or externally. The Museum of London supports many people’s concern about selling great works of art such as this sculpture and wishes to be considered as a permanent home for the piece. We believe that displaying Draped Seated Woman at the Museum of London or Museum of London Docklands, where visitors can enjoy the artwork freely and easily, will bring great public good for Londoners and visitors to the capital. We maintain that not only would this decision be in the public interest, but it is also the most viable option for the sculpture. The full press release can be read here. Such a transfer would not release new funds for Tower Hamlets Council, but it would remove the ongoing cost of maintenance and security, and possibly insurance (although this is not mentioned). Further, the Museum of London Docklands is located within the borough of Tower Hamlets, so would be a suitable choice for installation.